Pattern numbers occur on most Doulton ware and can be used to establish the date a pattern was first introduced. Some patterns, however, were long-lived and whilst the pattern number can establish the earliest possible date of a piece, the date of last use of a pattern is seldom if ever known. The A- and C-series earthenware and bone china date from the early years of the Burslem factory and although not rare are seldom seen. The ‘D’, ‘E’, ‘H’ and ‘V’ series patterns on earthenware and bone china date from about 1900 and encompass the collectible Doulton art nouveau and deco-style shapes and patterns. 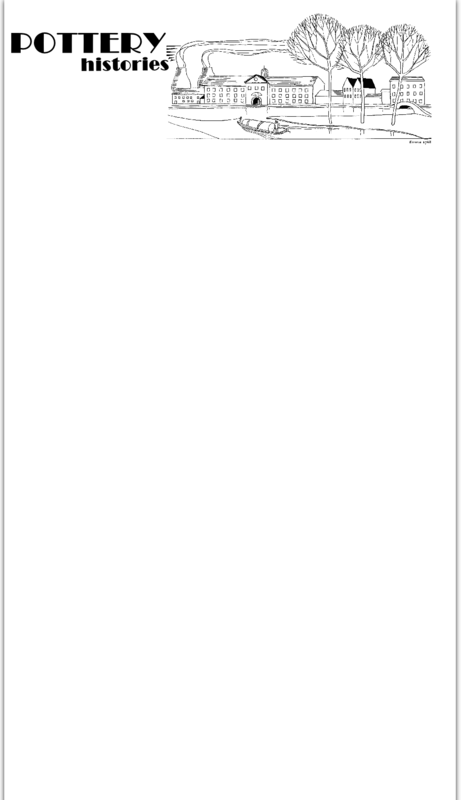 English Translucent China, later termed ‘Fine China’ is a translucent white porcelain manufactured without the use of bone ash (and thus is not ‘bone china’). It was a Doulton technical innovation introduced in 1960 as a fine china product that could be manufactured at substantially lower cost than bone china. Fine China is now the predominant Doulton body. To cope with their enormous output, Doulton used both in-house and freelance designers and painters, and in some cases these decorators also added pattern numbers to the wares. The best know is Robert Allen who added a ‘Ra’ number to wares decorated for Doulton in his design studio. The Robert Allen numbers are covered in more detail here. Pattern numbers prefixed by ‘HB’ or ‘BB’ are probably the work of Herbert Betteley, a Doulton designer and artist from 1886 to about 1930. There may be other artists who also marked their work. The Burslem ware is exceptionally diverse and there are at least seven series of patterns, each with an alphabetical prefix (A, C, D, E, H, V & TC) followed by three or four numbers. The same basic pattern may occur with multiple pattern numbers. A good example is ‘Tango’ which can be found with at least six different pattern numbers. 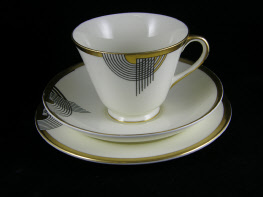 ‘Tango’ was released in 1934 on bone china with four colourways: V1481 (Gold band and black lines), V1482 (Black, Gold and Red), V1483 (Pale Blue band and Red lines), and V1484 (Green, Black and Red). Later, the pattern appeared on earthenware (D5505), and even later on another bone china shape (V 2353). ‘Tango’ (V2353) was released in about 1948. On bone china with a gold band and handle, this shape and pattern would have been targeted to an affluent and conservative market.